Tidbits from the one year anniversary interview with Weekly Famitsu. 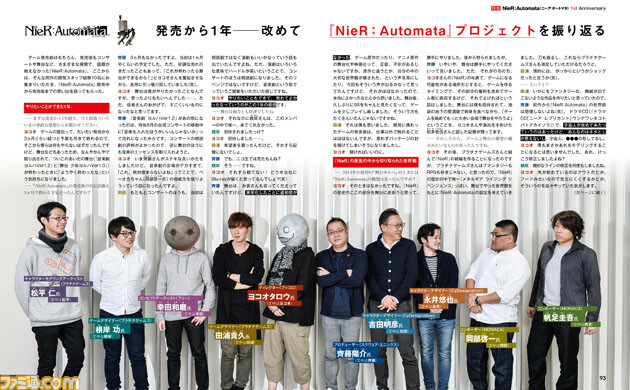 The latest issue of Weekly Famitsu has an interview with 10 members of the development staff of NieR: Automata in celebrations of its one year anniversary, including producer Yosuke Saito, director Yoko Taro, Platinum Games designer Takahisa Taura, and illustrator Akihiko Yoshida. The developers’ impressions of the last year are that they were able to do what they wanted and were happy that NieR: Automata sold well. They wanted NieR: Automata to sell one million copies, but never thought that it would break through two million worldwide. They feel that fans of the original NieR pulled through immensely for NieR: Automata. The amazing hunger of fans who have been supporting the series seems to have attracted the interests of new fans. Regarding NieR: Automata topics that have yet to be discussed, as a small trick, you can press the R3 button while holding one of the d-pad arrows to change the camera distance. However, using it can break through the terrain and bug the camera. After careful consideration, they left it in as it seemed very NieR. Regarding the future of NieR, nothing has been decided and it is unknown what the series will become, but given that 2020 is the 10 year anniversary of the series, they want to announce something big. They think it would be good if there is a new game announcement. NieR: Automata is available now for PlayStation 4 and PC.